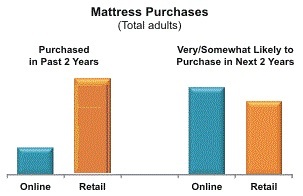 Purchasing mattresses via the Internet has gained a foothold among consumers and seems likely to gain in popularity. The study also includes a Price Sensitivity Analysis which explores how much target consumers are willing to pay for a mattress when purchasing it online. The contact lens market is holding its own amid challenges related to digital lifestyles, dry eyes and the growing fashion appeal of eyeglasses. The recently released 2016 Gallup Study of the U.S. Consumer Contact Lens Market finds the growing share of vision corrected consumers wearing both contact lenses and eyeglasses now report wearing eyeglasses for longer periods of time, while they spend fewer hours wearing their contact lenses. A long-term trend study in its 37th year, this comprehensive study provides up-to-date insights surrounding the habits and preferences of vision corrected teens and adults, contact lens wearers and prospective buyers. A Market Segmentation Analysis was conducted among the sample of current contact lens wearers to identify segments who share similar attitudes and behaviors regarding these products. Section1: General Population, including Vision Corrected Teens/Adults — Online interviews completed among a national sample of 1,513 teens and adults, ages 13 and older. The general population sample includes a sub-sample of 986 vision corrected teens and adults (wear eyeglasses and/or contact lenses to correct or improve their vision). Section 2: Contact Lens Wearers – – Online interviews completed by 830 current contact lens wearers ages 13 and older. Section 3: Prospective Contact Lens Wearers – – Online interviews completed by 524 prospective contact lens wearers ages 13 and older who currently wear only eyeglasses for vision correction but express an interest in trying to wear contact lenses. Awareness of and efforts to consume both probiotics and prebiotics have increased since 2012 with young adults, age 18-49, responsible for virtually all growth. The recently released 2016 Gallup Study of Probiotic & Prebiotic Consumers is the 5th in a series of consumer research surveys conducted to track consumer attitudes toward and usage of probiotics and prebiotics and their knowledge of product options available for including these ingredients in their diet. This study is based on interviews completed among 1,300 U.S. adults and also among a subsample 800 adults making an effort to consume probiotics and/or prebiotics. Trends are included where relevant from previous surveys. An optional Mothers Survey conducted among a national sample of 500 mothers of children under age 13 to investigate the children’s market for probiotics and prebiotics is also available. Contact us for information. Mothers are more attentive to the ingredients in their children’s toothpaste than they were two years ago and they are increasingly making efforts to avoid artificial sweeteners, artificial dyes, artificial flavors and alcohol. The recently released 2016 Study of Children’s Toothpaste examines mothers’ changing attitudes and habits with regard to their children’s toothpaste. Dog owners’ preference for natural or organic flea and tick products has grown steadily over the past decade, which may explain why some are seeking alternatives to topical drops. 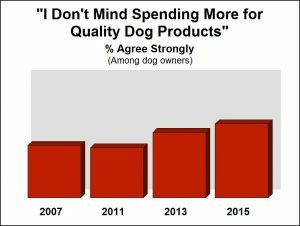 The recently released 2016 Gallup Study of the Flea & Tick Control Product Market, part of a trended series of surveys, provides valuable market insights into dog and cat owners’ awareness of, usage of and attitudes toward flea and tick control products. Details of the purchase process: retail outlet usage, how brand and form selection is made, veterinarian vs. retail purchase, etc. Market Segmentation Analysis is included to divide dog and cat owners into distinct groups, each with their own unique set of attitudes impacting receptivity to flea and tick control products. 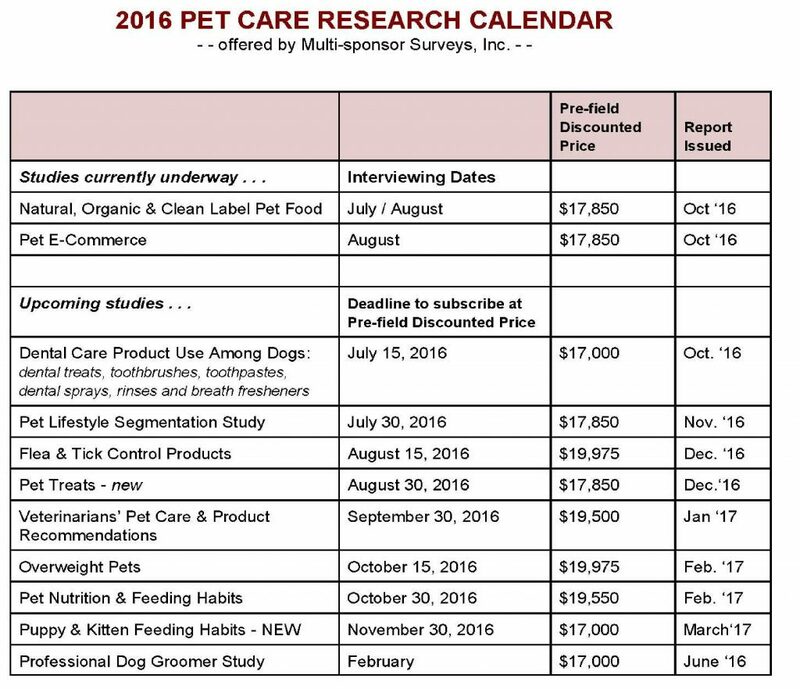 Multi-sponsor Surveys has been providing the pet industry with consumer trend data on pet nutrition, grooming and health care for over 20 years. Read on for news headlines from recent studies and our 2016 Calendar of studies. Key findings from recent studies. . .
Pet owners enjoy pampering their pets and take a lot of pride in their pets’ appearance. Pampering has been on the rise since the recession, as has willingness to spend more for quality dog products. Over half of dog owners say their dog sleeps in their bed, which may encourage more regular grooming. Interest in natural pet foods and grooming products has climbed in recent years. The flea and tick control market is in flux as use of topical drops has been declining over several years, particularly among dog owners. Older dog owners (age 50+) report use of topical drops more often than younger owners, while owners under age 50 more often use tick shampoos or soaps. Roughly half of dog owners express concern about their dogs’ safety when using topical drops and trends show an increase in preference for natural or organic flea and tick control products. The internet exposes pet owners to a wide variety of pet products and online shopping appeals most to Premium Pet Pamperers, the segment most willing to lavish time and money on their pets. Multi-sponsor Surveys is launching a new study in April to initiate regular trend monitoring of Online Shopping for Pet Products – to examine customer demand, preferred retailers, current habits, satisfaction and market potential. You are invited to design your own research package to take advantage of the savings available when multiple studies are purchased. You may choose from the 2016 studies listed above, as well as the currently available research listings on the next page. This annual trend study has tracked change in the flea & tick control products market for over 20 years, including tracking brand awareness and use, product satisfaction and attitudes. Conducted among a national sample of 750 dog owners and 750 cat owners, it provides insights into the process pet owners go through when selecting flea, tick and heartworm products. 2nd in a series of trended surveys, this study examines dog grooming habits and product use among a national sample of 800 dog owners with purchase responsibility. The study examines the grooming tasks they tackle themselves vs. hire out to grooming services. Trends in use of grooming products and brands are tracked, as well as dog owners attitudes. 2nd in a trended series, this study tracks cat litter brand preferences and selection criteria. Information about cat litter usage habits, product satisfaction, brand image and purchase habits is collected among a national sample of 600+ owners of cats who use litter boxes/trays at home. 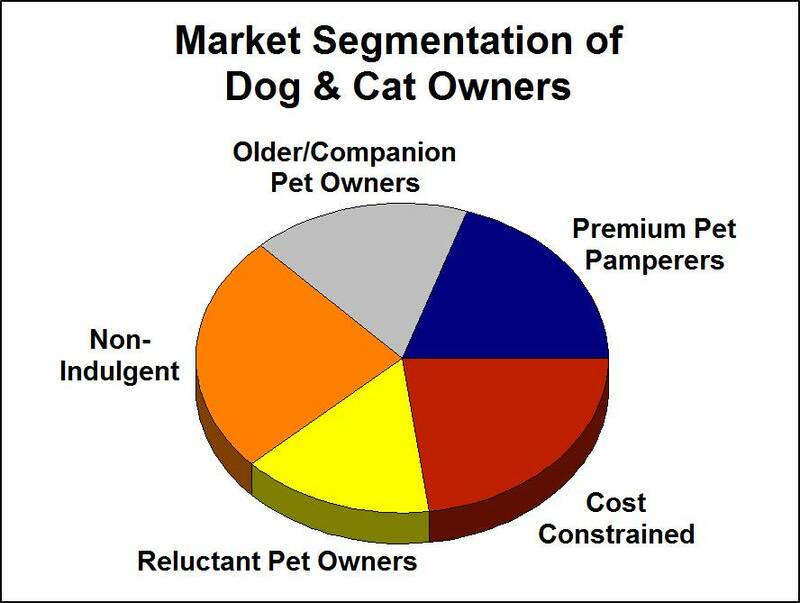 Each segment is profiled to identify which pet owners are best suited for specific pet products. This benchmark study examines the current and potential market for clean label pet foods among a national sample of 1,000 dog and cat owners. The study examines attention to pet food ingredient labels, the appeal of specific clean-label descriptors, brands associated with natural pet foods, willingness to pay more for clean labels and key drivers motivating interest. Examines pet food brand use, selection and satisfaction among a national sample of 500 dog owners and 500 cat owners. 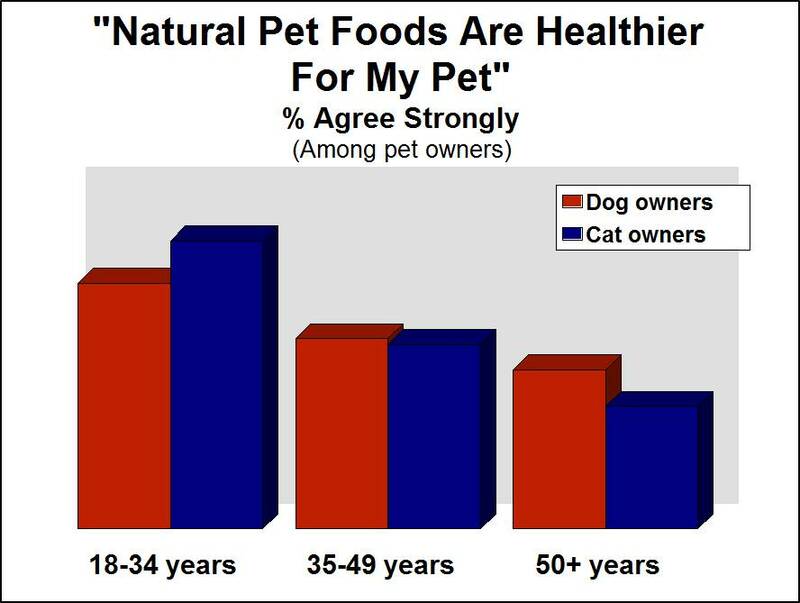 This comprehensive study provides information on packaged pet treats and pet supplements, as well as pet owners’ perceptions of the pet food industry and confidence in the health benefits possible through proper nutrition. Target Market Reports – – offer a lower-priced option when your information needs are targeted to a specific product category or market segment. Our Target Market Reports draw from the primary research studies listed above, including trends, market size projections and attitudes.